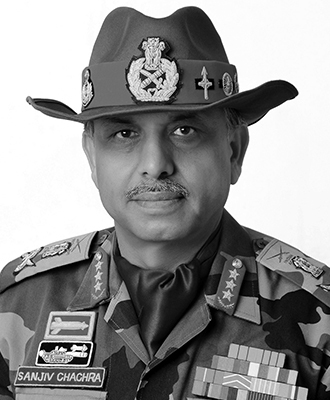 Lt. Gen. Sanjiv is one of the few Indian Army generals to have brought an upsurge in technological up-gradation in war fighting prowess, besides battling external issues. Fueled with an enthusiastic military career and expertise, he shares his immeasurable wisdom on leadership and motivation through his engaging sessions. He ensured the security and integrity of the Indo-Pak border as the General Officer Commanding-in-Chief of the Western Arm, and controlled the employment of 45,000 officers as the head of the HR management of the Indian Army. He also aided the government in launching major initiatives in infrastructure development, town planning, and welfare schemes for soldiers and ex-servicemen. Besides, he has represented the Indian Army and the government in various foreign delegations for training support and confidence building measures. For his dedicated service to the nation, Gen. Chachra has won many awards, like the Vishisht Seva Medal (VSM), the Ati Vishisht Seva Medal (AVSM) the highest award of Param Vishisht Seva Medal (PVSM) for his outstanding leadership and contribution to peace and nation building.